The Kel-Tec P-3AT is the lightest .380 ACP pistol ever made. This semi-automatic, locked breech pistol features a double action only firing mechanism. The slide stop has been eliminated and the magazine capacity reduced to 6 rounds due to the larger cartridge. Thanks to its locking dynamics and superior ergonometry, perceived recoil and practical accuracy are comparable to much larger guns. The P-3AT is mainly intended for plainclothes police officers as a secondary weapon, or for concealed carry by licensed citizens. how many magazines does it come with? Is the Crimson Trace removable? BEST ANSWER: Yes. Just remove two small hex head screws. I have one of these on a P32. How long has this brand been around and is it as good as Smith and Wesson? BEST ANSWER: Not as good as my. 380 bodyguard but not as expensive either. Get the price point you're comfortable with. 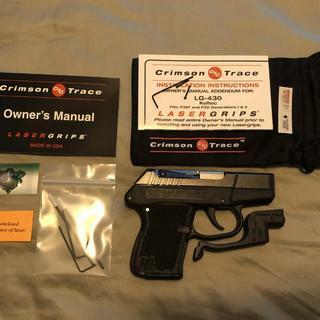 Does the Crimson Trace laser include the original packaging with the adjustment tools? BEST ANSWER: Yes it does include the adjustment/ removal tool and batteries. Mine also came with a voucher for lifetime battery replacement. Does not have box. The adjustment tools, swabs, and crimson trace manual are in the kel tec hard case. The laser is already installed on the pistol. Mine seemed to be sighted in when I took it to the range. Yes, it comes with the original packaging, adjustment tool, and battery. You'll need to adjust it after you put the battery in. It's very intuitive and easy to do. It comes already attached to the pistol. It does come with a soft pouch. And all necessary tools to install and adjust I do believe. It does have tools and directions. what is the Best type of ammo for this weapon ? BEST ANSWER: Just your trigger finger. What is the model number for the crimson trace? Also...lifetime batteries included? Is this avalable in Summerville? Retired law enforcement! Was a great deal at $199. Only one FTE in first 400 rounds. Laser makes up for the short sight radius. Even with the long trigger pull 4" groups at 15 yards is easily achievable with a little practice. Only problem so far is it's so easy to carry I forget it's in my pocket.Once again PSA had the best price around. Kel-Tech .380 is a good carry weapon when concealment of a larger pistol is an issue. I’ve put about 100 rounds down range and am very satisfied with the 380. Shoots well with hard sights or laser. Laser will be good for quick reaction and getting rounds off accurately when threat is initially presented. It is easy to carry concealed (front pocket) Long trigger pull and finding the break takes so me getting used to. After reading some of the reviews about trouble with getting the laser on target I was afraid that it would turn into a lemon. Not so, the laser does take some adjustment and you must back off on the opposite screw if it seems like you can't get the laser to move to adjustment. The Kel-Tec P3AT fits my pocket and you kind of forget about it. After two years of having a carry license but not actually finding a pistol that can be carried comfortably this fits the bill. I will be 69 next month and my eyes are not what they used to be so the laser works great for me. At 20 feet I can keep it in a 4" circle. It is not a comfortable gun to shoot because of the small grips and light weight but if I ever need it in a bad situation I don't think that will really matter. I use a shooting glove to train with. All in all a very good gun and laser. Out of the box the laser is already mounted but will need to be adjusted for better accuracy. I found this keltec to be decently accurate at 25ft to 35ft. You wont be winning any competitions but it shoot groups within 5 inches......thats accurate enough to get the job done while being attacked. The trigger pull is very long and heavy. You won't be accidentally shooting anyone with this gun. Excellent for a pocket pistol or for the ladies to purse carry. very reliable pocket gun, the most reliable of any Kel-Tec in my opinion. It just works, and the laser (~$120 value) is just a sweet bonus. Laser comes pre mounted but I decided to remove for EDC. I've carried a P3AT for years, usually as a back-up piece. It's eaten everything I've fed it, and accuracy is decent for a pocket pistol. I have small hands, so the small size doesn't bother me. The only knock is the sights - for an old fart like me, the vision isn't what it used to be, and even with glasses, they're hard to see. That's why I ordered this. I haven't been able to test it yet, but I'll hope the reliability of the pistol is the same as the one I already owned. As for the CT, the battery was simple to install, not rocket science. Lining up the laser with the iron sights was pretty straight-forward. Only one mag. Adjustment tools, CT drawstring bag for the pistol, manual, and a couple of cleaning swabs for the laser were included. In the photo, note the mag is in the pistol. Also, the case for this P3AT is considerably larger than the case that came with my original P3AT. Not seen is the battery for the CT sight, already installed. Great gun Great price get the pocket clip and you want even know you have it on!!!! Nice enough for the money. The pistol works as expected. I am not able to sight the laser in vertically. The laser points up steep that after about five feet it is so far above point of aim that it is not really usable. At that price with free shipping and with the Crimson Trace laser you can’t go wrong. This gun has been out and has proven itself for a long time. Even Ruger had to copy it with its LCP which I own with the same laser on it as well. The Kel-Tec may be rough around the edges, but a solid gun nonetheless. Overall not happy with it. Not a knock on PSA, they are and have always been awesome. The laser came sighted off by about 2-3 feet to the right and will not adjust. Also experienced a jam during the first box of ammo fired through it. Minus the jam, the action is good and easy to control. Size makes it difficult to find a comfortable grip which I’m sure will get better with more use. Loading ammo into magazine is easy. A very nice backup gun and wonderful laser. Palmetto has the fastest shipping I have ever experienced. I have purchased many of their products without disappointment. Great prices and service. It's a little smaller than I would have preferred, but it is a great pocket pistol for shorts. The price made it hard not to pass up. A petit cousin wants one for her purse. This is a fine pistol in this price range. The laser is a nice feature since it is point and shoot, not aim and shoot. Laser not stable but sufficient. Laser sight not stable. Off after a few days of carrying. Still good enough to get in center of mass. I'll just readjust occasionally. Still a good deal for the price. Bought one for the wife. Her lady Smith 38 special P+ was a little hot for her. She'll just have to use more bullets. Got it FAST, great gun. 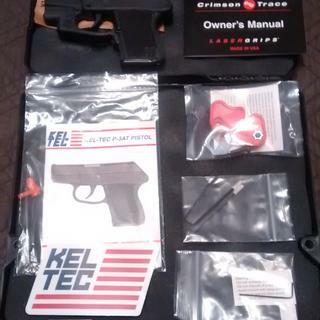 Fabulous deal on this well proven Key-Tec, super small but effective 380. Laser gives confidence the target is hit. When i picked it up from my local FFL, they were shocked at how great a deal it is. They were selling the gun w/o laser for $50 more. If you are on the fence, buy it NOW.